Wer ist eigentlich Sigutė Chlebinskaitė? Und was mag/macht sie für Kinderbücher? Die Illustratorin aus Litauen erzählt über sich und ihre Arbeit. – How did you start to illustrate books for children (and young people)? I started illustrating books when I was a child. I used to create things interesting for myself and worth showing to others. Some of illustrations from the books I was browsing I would redraw on square paper, including the copying of letters, and some of the books I even complemented with my drawings, e.g., Antoine Saint-Exupery’s „Little Prince“). From time to time my drawings were printed in children’s magazine “GENYS”. During long autumn evenings, when my grand-father Vaclovas would prepare herring or peel apples, I would sit together with my cousin and draw. It often seemed to me that her drawings were better. I remember that once I was so upset that I could not portray winter as I wished, I scrunched up the drawing and threw it into the fireplace. But there came in my aunt who pulled out the drawing, folded it and showed what was great in it and said why it was great. Perhaps in the kindergarten I was already „broken“ to think in a clichéd way and taught to draw in accordance with the standards. So I think that my scrunching of the drawing and the appearance of its transfer print afterwards inspired me to look at everything in a new way and complete the work in a way totally different from the initial thought. And up until now I have kept the drawing as a reminder of this important lesson. Later I studied in a wonderful oasis full of wonderful teachers, at the Fine Arts Department of M.K. Čiurlionis Gymnasium. It was there that I fell in love with graphics techniques; so much that it was difficult to put me off from the etching printing press. My mom was worried to see me always return home very late and more than once threatened to blow up the Fine Arts department (seen in today’s situation in the world, her words may sound threatening, but then it was just a joke). Lying in bed with closed eyes, often I would visualize a new idea. I would jump out of bed to put the idea on paper. At other times, while walking in the park, I would see a vision of my future work. Maybe the same happens in poetry, ideas just occur, simply they should be perceived up and captured on paper? When the borders of my country were still closed we could dream of other countries only in our drawings. Once I participated in a drawing contest on the topic of „Italy of my dreams“. That year, one of the first hot air balloon festivals took place in Vilnius, making a great impression on me. In the library I found an album of Rome, and a collage of thoughts was born: the Rome’s skyline and hot air balloons over it. This collage is probably one of the most successful of my works, because for this drawing of a dream I was invited by Moscow to tour through Italy for as long as as a couple of weeks! It would be curious to see this work again, after 24 years. A bit later, I visited Rome, but regretfully, did not see the flying balloons in its sky. I saw on the Internet that today children living in refugee camps dream in a similar way dream. However, instead of hot air balloons they are drawing flying carpets. One of the most memorable illustration lessons, when I actually created illustrations for small editions books (1-5 pieces??? ), took place in Salzburg Summer Academy, during workshops given by the Polish artist Z. Januszewski and later, by the Canadian artist Michele Lemieux (the author of the the bestseller „Stormy Night“), and also in the Prague Academy of Fine Arts where I worked in probation in the famous Czech illustrator Jiri Šalamoun’s ( the author of „Maxi dog FIX“) class. After the restoration of Lithuania’s independence, the publishing culture and politics in the country changed dramatically. The only state-owned children’s literature publishing house „Vyturys“ was closed, new publishing houses opened. While still a student of the Vilnius Academy of Arts, I was offered to illustrate poetry books for children. The deadlines were extremely tight – in less than a month, I had not only to create illustrations, but also to provide the final layouts for printing. Back then we are proud of the talented work created by probably the most famous artists of Lithuanian illustration golden age, Algirdas Steponavičius and Birutė Žilytė, who managed to reach an agreement with the publishers to illustrate their books for five or even ten years. When I was a child, books illustrated by these artists both attracted and scared me, but later we realized that their creation nurtured your worldview and aesthetic perception. Similarly, I was impressed by the works of a very different stylistics by M. C. Escher and Klaus Ensikat; I used to buy their books for the money saved in the „dollar“ foreign book bookstore in Vilnius old town. I think that a well-designed children’s book should be equally interesting for children and for adults. In later years we simply check up what we were offered in the childhood. Today, perhaps the hardest thing in the illustrator’s work is not to quote and not to imitate other artists you are really fond of, but rather to discover your own way and own visual language, which would be of catch attention of the reader. Erste Bücher habe ich schon als Kind illustriert. Ich zeichnete Dinge, die interessant für mich waren und die ich anderen gern zeigen würde. Manchmal zeichnete ich Illustrationen von Kinderbüchern, in denen ich blätterte, einfach in ein kariertes Heft ab, auch die Buchstaben kopierte ich, einige der Bücher, die ich las, ergänzte ich um eigene Zeichnungen (so Antoine de Saint Exupérys „Kleinen Prinzen“). Einige meiner Illustrationen wurden auch in der Zeitschrift für Kinder „Genys“ abgedruckt. Solange die Staatsgrenzen geschlossen waren, träumten wir in Zeichnungen. Einmal nahm ich an einem Wettbewerb in meinem Traumland Italien teil. In Vilnius fand in jenem Jahr eines der ersten Luftballon-Feste statt. Ich war tief beeindruckt. Ich lieh mir ein Album über Rom in der Bibliothek und eine Gedanken-Collage wurde geboren: eine Panoramaansicht Roms und über der Stadt Luftballons. Das war vermutlich eine meiner gelungensten Arbeiten, denn für diese Traumarbeit wurde ich eingeladen, über Moskau nach Italien zu reisen – für ganze zwei Wochen! Es wäre interessant, diese Arbeit heute, nach 24 Jahren, wiederzusehen. Bei allen späteren Besuchen in Rom sah ich kein einziges Mal vor mir, dass Lufballons über der Stadt fliegen. Ich habe im Internet gesehen, dass heute die Kinder in den Flüchtlingslagern in ähnlichen Halbtönen träumen, nur sehen sie keine Luftballons mehr sondern fliegende Teppiche. Zu den Werkstätten, während der ich Illustrationen für Bücherunikate zeichnete und die bei mir die tiefsten Eindrücke hinterließen, gehören die des Polen Zygmunt Januszewski und später der Kanadierin Michelle Lemieux (Autorin des Bestsellers „Stormy Night“) anlässlich der Salzburger Sommerakademie. Ebenso tief geprägt hat mich die Zeit als Stagiaire beim tschechischen Autor Jiří Šalamoun an der Prager Kunstakademie. Nach der Wiedererlangung der Unabhängigkeit durchlebten das litauische Verlagswesen und die Publikationspolitik tiefgreifende Veränderungen. Der einzige Verlag für Kinderliteratur „Vyturys“ stellte den Betrieb ein und andere Verlage wurden gegründet. Noch während des Studiums an der Kunstakademie illustrierte ich Poesie für Kinder. Die Termine waren jeweils sehr knapp bemessen – in weniger als einem Monat musste ich nicht nur die Illustrationen zeichnen, sondern auch das fertige Buchlayout an die Druckerei senden. Wir sind in Litauen stolz auf Algirdas Steponavičius und Birutė Žilytė, zwei der herausragendsten Zeichner des litauischen goldenen Zeitalters der Buchillustration – sie konnten die Zuständigen bei den Verlagen davon überzeugen, ihnen für die Illustration eines Buches fünf oder gar zehn Jahre Zeit zu geben. Als Kind zogen die von ihnen illustrierten Bücher uns magisch an und erschreckten uns auch, aber als Erwachsene begriffen wir, dass das etwas war, was die Weltsicht und das ästhetische Verständnis heranbildete. In ähnlicher Weise imponierten mir auch Werke von einer ganz anderen Stilistik – von M. C. Escher und Klaus Ensikat illustrierte Bücher, die ich mir von meinem Ersparten in der „Dollar“-Buchhandlung für ausländische Bücher kaufte. Ich bin der Meinung, dass ein gutes Kinderbuch nicht nur im Kindesalter sondern auch später, für das große Kind interessant sein sollte. Wenn wir erwachsen sind, überprüfen wir, was uns als Kind angeboten wurde. Am schwersten fällt heutzutage wohl, nicht zu zitieren und andere Künstler nachzumachen, die man sehr mag, und seinen eigen Weg und seine eigene visuelle Sprache zu finden, die andere anspricht. – Which of your books should everybody be familiar with (and why)? Like the famous Italian designer Bruno Munari, I am not only the children’s book creator. I create books together with children, and their families during „The Land of Books“ workshops („Knygų šalis“, founded in 2002). These creative workshops are more than simply the time to keep children occupied. On the contrary, they are workshops aimed at creating unitary books which Lithuania’s publishers would not dare to publish due to often rather intricate paper engineering techniques. Therefore, using specially constructed stencils, each child creates his or her own illustrations and stories, which, as we joke, these children will pass to their grandchildren, and about a hundred years later someone will discover them again and say: this is what they knew back then, and now we are no longer able to do that. 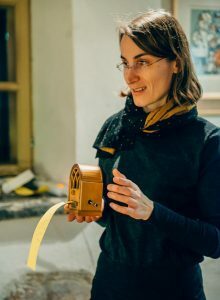 Such thoughts and the workshops were inspired by Lothar Megendorfer and Ernest Nister – the authors of the first books for children published in the 19th century. I will be forever thankful to the IJB Library’s archives for the unique opportunity to discover this invaluable material. In my everyday work, I encounter from time to time publications about children, but not for children. For example, two years ago we published teacher’s Henry Fuchs diaries stored in a private collection, „Nida School chronicle“. 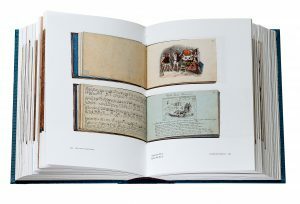 The publication is in German language, with facsimile insets of contemporary bank notes, letters, documents and comments in the way they were presented in the handwritten „Nida school chronicles“. For me it was important not to damage the feeling of the original chronicles in any way and put in the insets and inserts in the places they actually were found in the original diaries. These „games“ are rarely practiced in publications for adults, but I finally managed to convince the customer, and the publication saw the daylight according to my idea. This spring, a few more books were born. 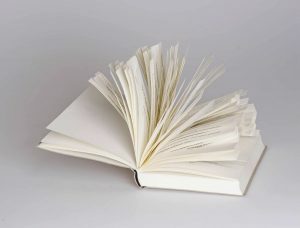 One of them is a publication about albumistics and memories‘ book tradition titled „Gardens of memory“ (Album amicorum). Working in LMAB (www.lmab.lt) archives with the originals, each time I marvel at human sophistication and amazing skills of the people who lived in 17th-19th centuries. 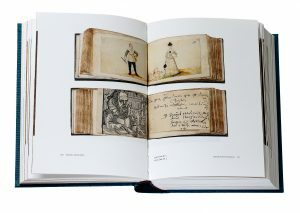 Each little album is wonderfully illustrated and bound. In the albums,coloured pages dominate. It should be noted that illustrations in the form of drawings and paper cuttings were the traits of every educated and literate person of that time, rather than an exclusive feature of art academy students. The other new title published this spring is a book by Stasys Eidrigevičius, one of the most famous and probably the most internationally acclaimed Lithuanian artists, „Singing Rooster head“ – a poem illustrated with his drawings, archive photographs and other materials. It makes me happy to see those who browse this book, very pleased with it. Also, it is unique for the fact that it contains the text in two languages (official Lithuanian and a Lithuanian dialect). The official / dialectical language is displayed on narrower pages, which, after a publication was binded, were manually stripped off. 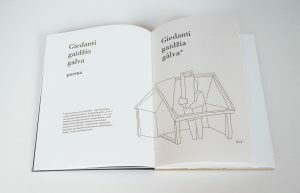 Part of the book edition was hand numbered by Stasys. I never regretted my idea to use tangrams to illustrate a poetry book for children by Vladas Braziūnas „The Life of Jackdraw Kro and vice versa“. I wanted the book to be interactive – while parents are involved in reading poetry, the child could himself become an illustrator and make a bird’s tangram from geometric shapes. The puzzle reminds of an illustrator’s work before the computer era, when the whole composition construction work was like a puzzle. This summer, I accidentally discovered that on tangram’s theme FLUXUS followers used to improvize. It cheered me up. Seems to me that I have not yet created my best books cherished by my imagination, but it was a pleasure to hear that my debut book „What is happening in the courtyard“ by Kazys Jakubėnas, was noticed by children’s literature critic Jeanine Despinette (France) and Monica Monachesi, curator of illustrators‘ exhibition in Sarmede (Italy). At the Book Fair in the Lithuania’s stand, I was asked for illustrator’s contacts of my book. For me, it was so unexpected, I was so humbled that I did not dare to say that actually I was the illustrator, and just wrote contacts of the book’s publisher, and the artist, i.e., my own address. Later, for this work I gained recognition from the OCTAGONAL. Wie der italienische Designer Bruno Munari bin ich nicht nur Kinderbuchschöpferin. Kinderbücher machen wir auch mit Kindern, Familien während der Kreativwerkstätten „Bücherland“ (seit 2002). Diese schöpferischen Werkstätten organisieren wir nicht einfach, damit die Kinder beschäftigt sind, sondern, damit Bücherunikate das Licht der Welt erblicken, die die meisten litauischen Verleger wegen der manchmal schwierigen Papieringenieurskunst nicht herausgeben würde. Deshalb kreiert jeder auf speziell vorbereiteteten Bücherrohlingen seine eigenen Illustrationen und Geschichten, die die Kinder, wie wir lachend sagen, ihren Enkeln hinterlassen, und wenn die Menschen sie in 100 Jahren entdecken, werden sie sagen: Seht nur, wie die das damals konnten, wir können das nicht mehr. Diese Werkstätten werden begleitet von Publikationen der Kinderbuchautoren Lothar Megendorfer und Ernest Nister, die uns auch dazu inspirierten. Für die Gelegenheit, sie zu entdecken, bin ich den Archiven der Bibliothek von www.IJB.de von Herzen dankbar. In meinem Arbeitsalltag begegne ich ich Publikationen, die auch von Kindern handeln, jedoch nicht für Kinder sind. Ein Beispiel hierfür sind die vor zwei Jahren erschienenen, in einer Privatsammlung befindlichen Tagebücher des Niddener Lehrers Henry Fuchs – Chronik der Schule zu Nidden. Das Buch in deutscher Sprache beinhaltet auch Faximile von Einklebeblättern, damaligen Geldscheinen, Briefen, Dokumenten und Kommentaren, so wie sie in der Handgeschriebenen Chronik der Schule zu Nidden zu finden waren. Für mich war wichtig, das charakteristische Leben der Originalchronik zu erhalten und die Einklebeblätter und Einfügungen an den Originalstellen zu belassen. Solche „Spielereien“ sind unüblich für Erwachsenenpublikationen, doch ich vermochte den Auftraggeber zu überzeugen und die Publikation entspricht den Vorstellungen, die ich von ihr hatte. Diesen Frühling erblickten noch einige weitere Bücher das Licht der Welt. Eine Publikation zur Tradition der Albumistik und der Erinnerungsbüchlein „Gärten der Erinnerungen.“ Während meiner Arbeit in den Archiven der Bibliothek der Litauischen Akademie der Wissenschaften wunderte ich mich jedes Mal über die Erudition, die Talente der Menschen im 17.-19. Jahrhundert. Jedes kleine Album ist wunderschön illustriert und gebunden. Die meisten Seiten sind farbig. Das Illustrieren mit Zeichnungen, Scherenschnitten, Noten, Einklebeblättern gehörte zu jedem gebildeten Menschen jener Zeit und war kein besonderer Zug von Studenten der Kunstakademie. Eine andere Neuheit dieses Frühlings ist das Poem „Der singende Kopf des Hahns“ von Stasys Eidrigevičius, eines der berühmtesten und des wahrscheinlich weltweit bekanntesten litauischen Malers, illustriert mit seinen Zeichnungen und Fotografien aus seinem Archiv und weiteren Materialien. Darin zu blättern macht große Freude. Ich brauche noch etwas zeitlichen Abstand, bis ich sehe, wie das Buch in Wirklichkeit gelungen ist. Es ist auch deshalb ein besonderes Buch, weil der Text zweisprachig in Litauisch und im Heimatdialekt des Malers zu lesen ist. Der originale Dialekttext ist auf schmaleren Seiten abgedruckt, die nach dem Nähen des Buches noch von Hand abgezupft wurden. Ein Teil des Buches ist vom Künstler nummeriert. Ich freute mich sehr, dass ich dem Dichter Vladas Braziūnas vorgeschlagen habe, seinen Gedichtband für Kinder „Das Leben der Dohle Kro und umgekehrt“ mit Tangrams zu illustrieren. 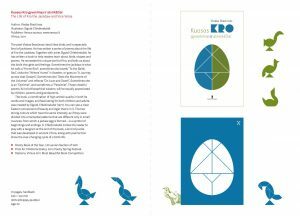 Die Idee war ein interaktives Buch – dass das Kind, während die Eltern die Gedichte vorlesen, selbst zum Illustrator wird und aus geometrischen Formen ein Vogel-Tangram zusammensetzt. Das Puzzle erinnerte auch an die Arbeit des Illustrators in der Vor-Computer-Ära, als die ganze Arbeit der Komposition einem Puzzle glich. Diesen Sommer habe ich zufällig entdeckt, dass auch die Leute von Fluxus mit Tangrams experimentierten. Das war eine große Freude. Was das Schaffen, das in Erinnerung bleibt, betrifft: Ich glaube, meine besten Bücherideen, die mir durch den Kopf schwirren, habe ich noch nicht verwirklicht, aber es war wirklich schmeichelhaft, als mein Debüt in Kazys Jakubėnas’ „Kas kiemely darosi“ (Was tut sich auf dem kleinen Hof) bei der Kinderliteraturkritikerin Jeanine Despinette und der Kuratorin der Illustratorenausstellung in Samede Monica Monachesi auf Beachtung stießen. Ich war damals am litauischen Stand auf der Buchmesse (in Bologna, Anm. des Ü.) und man bat mich um die Kontaktdaten der Illustratorin meines Buches. Das kam für mich so überraschend, dass ich vor lauter Schüchternheit nicht zu gestehen wagte, dass ich es bin, und einfach die Adressen des Verlegers und der Künstlerin (meine) aufschrieb. Später erntete ich für diese Arbeit die Anerkennung von OCTAGONAL. – Which theme or motif would you love to work on in a children’s book some day? I have thought of as many as several picture books, one of them will be titled „A Tea® for two“. I am still naively hoping to enter a financially safe stage for at least a couple of months to be able to implement this idea, to find a publisher/sponsor or to become such a publisher myself. Also, I have always been inspired by vast illustration opportunities which ABC books have, by improvisation on geometric shapes, colour education topic, introduction of the subject, herbariums with a fantasy, „upsidownia“ and other things that would touch our little hearts and minds. It is important to work hard on sensitive historical memory issues (for example, a few years ago pupils collected material and participated in a writing contest „My grandparents‘ and great-grandparents‘ neighbours, the Jews“). And it is always fun to discover and publish something beautiful but well forgotten. This year, I was more than surprised to find out that children’s literature classics Edward Lear’s art has never been published in Lithuania. After all, he is a unique artist who became famous not for painting landscapes, but for children’s books! My mind is teeming with a multitude of ideas that are begging to be born. Thank you for your attention, thoughtful questions and for your time reading my thoughts. Ich zumindest ein paar Bilderbücher im Kopf, von denen eines den Titel „A tea(r) for two“ tragen soll. Ich hoffe noch immer naiv, zumindest für zwei Monate in eine Zone der finanziellen Sicherheit zu kommen, um dieses Vorhaben verwirklichen zu können, und auch einen Verleger / Sponsor zu finden oder selbst dazu zu werden. Und auch die weiten Gefilde der Illustration der ABC-Bücher, Improvisationen mit geometrischen Formen, das Thema des Kennenlernens der Farben, Herbarien mit Fantasie, „Upsidedownia“ und andere Dinge, die mir ins Herz und ins Gedächtnis fallen, sind stets eine Quelle der Eingebung. Wichtig ist auch, mit diffizilen Themen der historischen Erinnerung zu arbeiten (so sammelten vor ein paar Jahren Schüler Material und nahmen an einem Schreibwettbewerb zum Thema „Die jüdischen Nachbarn meiner Groß- und Urgroßeltern“ teil). Und es macht immer wieder Freude, etwas Schönes aber in Vergessenheit Geratenes zu entdecken und zu veröffentlichen. Dieses Jahr stellte ich mit großem Erstaunen fest, dass kein einziges Werk des Klassikers der Kinderliteratur Edward Lear in litauischer Übersetzung vorliegt. Und dabei war er doch ein einzigartiger Künstler, berühmt geworden nicht durch seine Landschaften sondern durch seine Kinderbücher! In meinem Kopf schwirren unzählige Gedanken herum, die darum bitten, geboren zu werden. Danke für Ihre Aufmerksamkeit, die wertvollen Fragen und das Lesen des Textes.